Bull head rhyton, Minoan, 14th–13th century BCE. Painted terracotta. From Karpathos (Greece). The British Museum, London, Donated by W. R. Paton, 1887,0501.6 (A871). © The Trustees of the British Museum. All rights reserved. Each of the elaborate vessels in our special exhibition Animal-Shaped Vessels from the Ancient World: Feasting with Gods, Heroes, and Kings tells an interesting story. Take, for instance, a bull head rhyton (“flowing vessel”) from the Bronze Age. It was found in a tomb on the Greek island of Karpathos, among pottery imported from nearby Crete, where the Minoan civilization flourished. 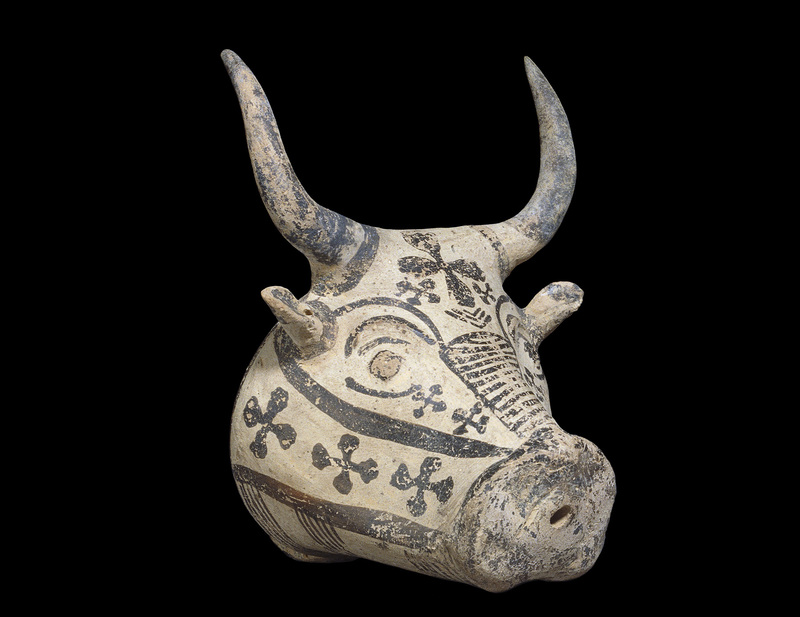 The bull was an important animal in Minoan religion. Bull rhyta had two openings, one of which may have been used to pour liquid offerings. The rhyton is just one of many animal-shaped vessels in the exhibition that belong to this unique category of drinkware used for social and ritual occasions in cultures and regions throughout the ancient world. The depicted animals, both lifelike and imaginary, often had symbolic or metaphorical meanings. These fascinating objects—their forms and histories—provided rewarding research opportunities for those who helped shape the exhibition. Curator Susanne Ebbinghaus, the George M.A. Hanfmann Curator of Ancient Art, led the exhibition team, which included the curatorial assistant for special exhibitions and publications in the museums’ Division of Asian and Mediterranean Art, current and former Frederick Randolph Grace Curatorial Fellows, and Harvard Ph.D. candidates who served as interns. We asked the team to describe their favorite objects in the exhibition. Read on for what they had to say. 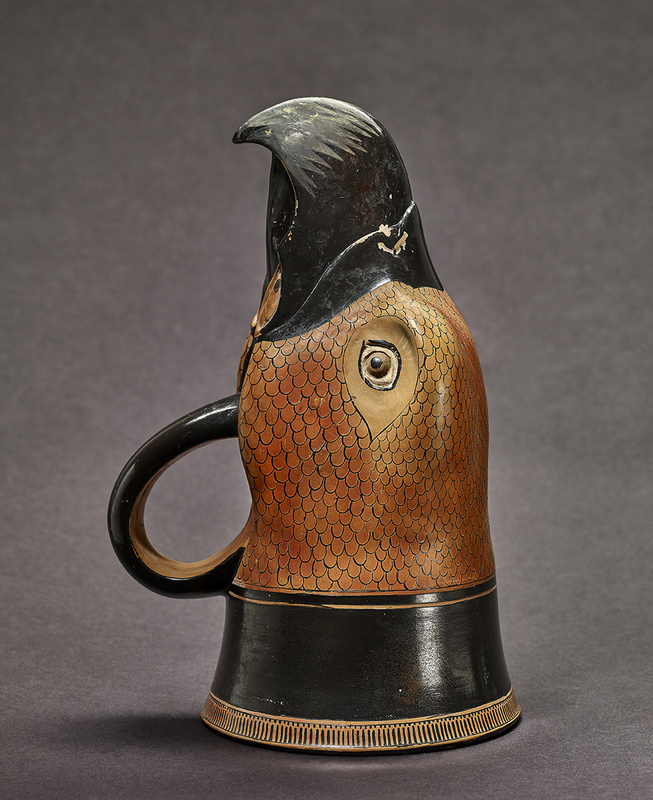 Eagle head mug, attributed to Douris, Greek, Attic, 490–470 BCE. Terracotta, red-figure technique. From Capua (Italy). The British Museum, London, 1873,0820.274. © The Trustees of the British Museum. All rights reserved. This eagle head mug is made without a base, so that it can’t be set down when full of liquid. This means that the drinker would potentially have to drain the entire cup before being able to set it down. But more interesting is that when set on its rim, the mug also resembles a perched eagle, with the beak becoming the head, the eyebrows the wings, and the rim the tail feathers. This neat double representative function makes this vessel formally similar to other optical illusions, such as black and white images that can alternatively be seen as a vase or two faces. It also suggests that ancient Greeks had multiple possible interpretations in mind when they were crafting such vessels. Beaker with the forepart of a crested and winged lion, Iranian, 6th century BCE. Gold. Metropolitan Museum of Art, New York, Fletcher Fund, 1954, 54.3.3. © The Metropolitan Museum of Art. Image: Art Resource, N.Y. 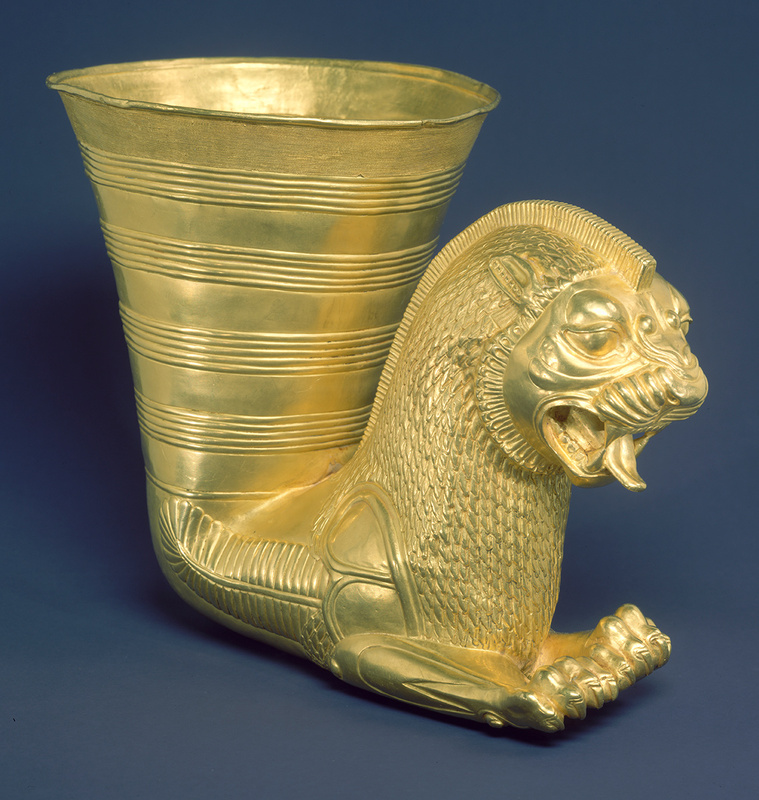 This glittering golden beaker is immediately inviting, coaxing the viewer to examine its splendor up close. Its technical craftsmanship is astoundingly advanced. Look closely—wrapped around the upper part of the beaker are 136 feet of tiny gold wire. The subjugation of such a fantastic creature is a powerful claim; this vessel is at once functional and aesthetically brilliant. It is a marvelous piece, tempting all who look upon it to reach out, take a drink, and share in its grandeur. Footed rhyton with horned head, Roman, 1st–2nd century CE. Glass. The British Museum, London, Bequest of James Woodhouse, 1868,0110.510. © The Trustees of the British Museum. All rights reserved. Wall painting of a banquet, Roman, 1st century CE. Fresco. From Herculaneum (Italy). 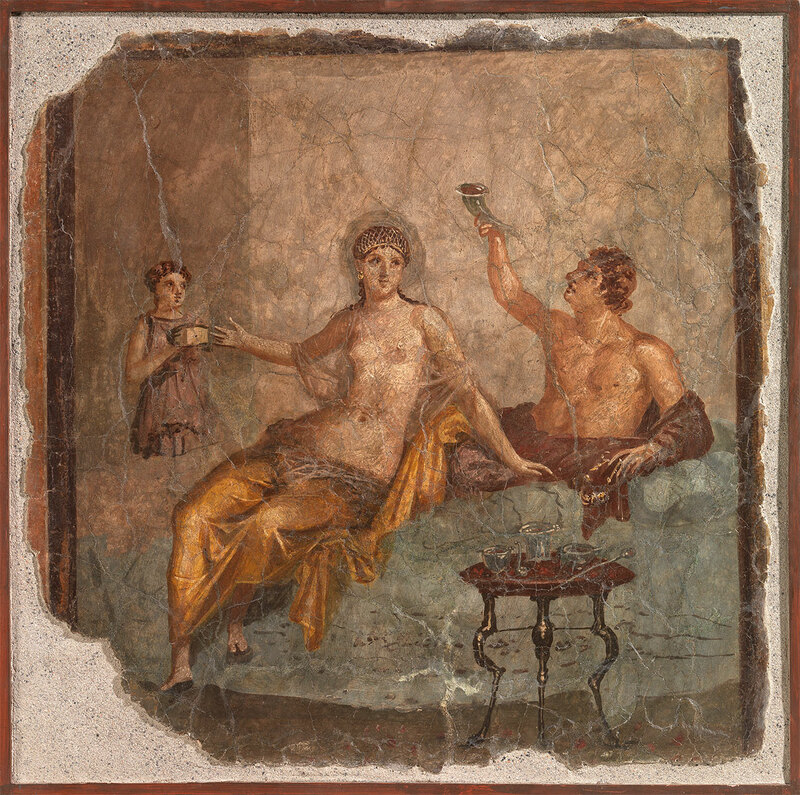 Museo Archeologico Nazionale di Napoli, Naples, 9024. © Archivio dell’Arte, Pedicini photographers. 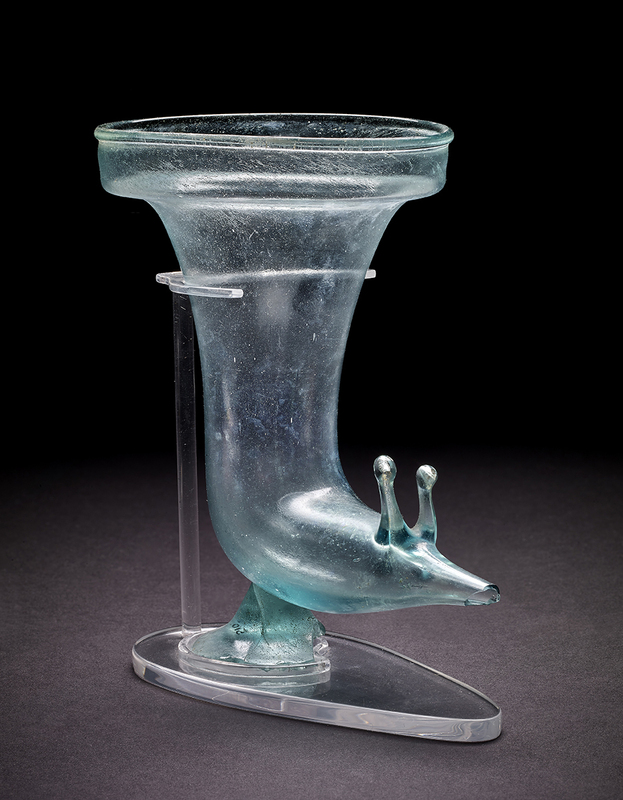 The minimalist animal head of this glass rhyton, above left, creates an elegant and even playful object. Ancient Romans increasingly used glass at their dining tables because it was relatively inexpensive compared to gold, silver, or bronze. This object is particularly interesting when paired with the Roman wall painting pictured at right, which depicts a banquet attendee holding a silver-colored rhyton filled with liquid; this particular rhyton may or may not have been used that way. We’ve all poured a glass of water and know what the material feels like, how heavy it is, what it sounds like when liquid hits its surface. So it’s possible to imagine using this ancient vessel, too, which I think makes it one of the most relatable objects in the exhibition. Rhyton with a centaur holding a goat, Perhaps Saka, late 1st millennium BCE. Bronze and copper. From Gilgit (Pakistan). Ashmolean Museum of Art and Archaeology, University of Oxford, EA1963.28. © Ashmolean Museum of Art and Archaeology, University of Oxford. 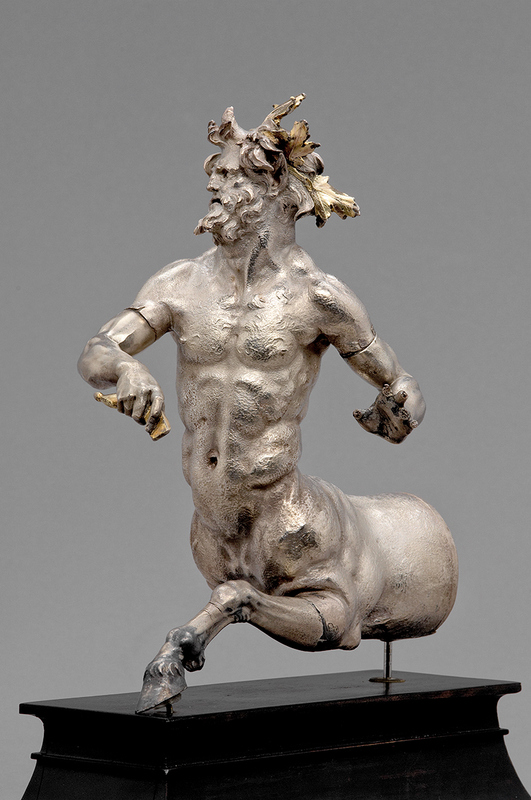 Centaurs are common in Greek and Roman art, including rhyta, but this centaur is unique. His entire body is represented, meaning he can stand on four legs; most rhyta cannot. He holds a goat in his hands, suggesting hunting or sacrifice. And he has scary red eyes. This rhyton was found in Pakistan in 1940, and may have been made by Scythians from Central Asia sometime between 400 and 200 BCE. 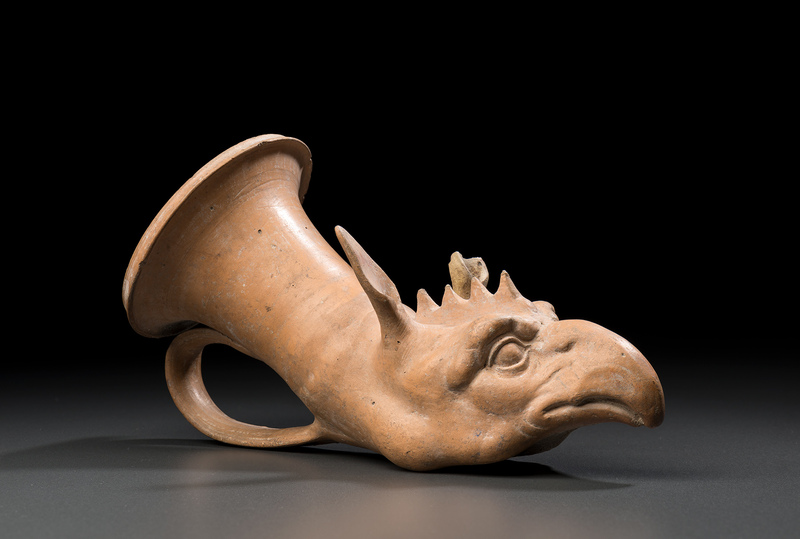 Central Asian art in this period is often regarded as deriving from Greek art, yet this rhyton shows a vibrant and original artistic tradition there. In other words, the people who made this object had their own ideas about centaurs. Griffin head mug, Greek, South Italian, Apulian, second half 4th century BCE. Terracotta. From Ruvo (Italy). Museum of Fine Arts, Boston, Henry Lillie Pierce Fund, 00.361. © 2018 Museum of Fine Arts, Boston. It’s fascinating to imagine this mug doubling as a mask, like many of the Athenian animal head mugs used at parties. We think this particular example was intended for use as a grave object, however. The drinker would get the chance to “transform” into a griffin only at extravagant feasts in the afterlife. This vessel stands out visually from the other Greek pieces in the exhibition because its terracotta surface is plain instead of painted with the usual red-figure decorations. Perhaps it was once painted with pigments that did not survive, but I find that the absence of paint allows the viewer to focus in on the sculptural qualities of the vessel. The carefully modeled muscles, beak, and eye sockets in the griffin’s face create the impression of a really fearsome beast. Rhyton forepart in the form of a centaur, Hellenistic, c. 160 BCE. Silver, partially gilded. From Falerii Novi (Cività Castellana, Italy). Kunsthistorisches Museum, Vienna, VIIa 49. © KHM-Museumsverband. This rhyton exemplifies the dramatic qualities common to Hellenistic art. The centaur’s twisting body, active arms, and wild hair capture the excitement of a wine-fueled dance. Looking at this vessel in the gallery gives the viewer only a partial sense of how the ancient feast-goer experienced it. Its size and weight would have certainly left an impression, but drinkers must have marveled as they stared into the centaur’s face while consuming the wine flowing from his body. The ancient drinker was likely dazzled by this decadent and imposing vessel, but beyond the precious metal and fine artistry lay a warning: drink too much and you may start acting like a wild centaur! 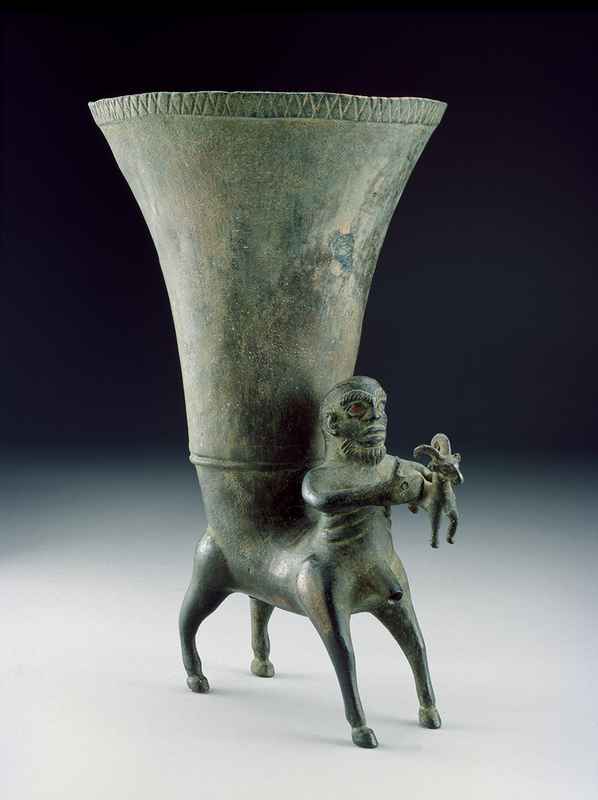 Double vessel with monkey, Chimú (Peru), 14th–15th century CE. Silver. Metropolitan Museum of Art, New York, The Michael C. Rockefeller Memorial Collection, Gift of Nelson A. Rockefeller, 1969, 1978.412.167. 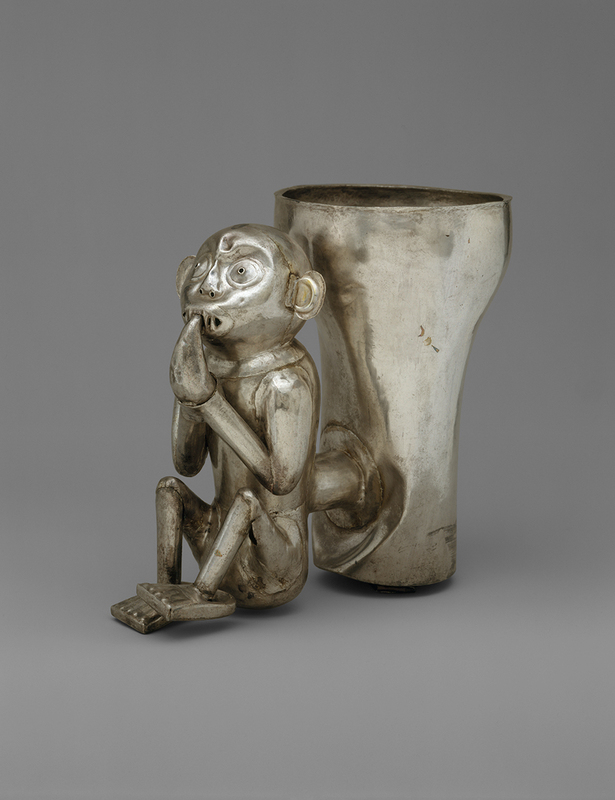 Do not be deceived by the suppliant look of the monkey in this silver double vessel. Though sitting demurely, and seemingly preoccupied with the fruit in its hands, this rascal hides a surprise: a sphere inside its hollow head forces air out whenever liquid moves within the beaker. The monkey whistles, and a stealthy drink becomes impossible. Intricate and ingenious, this vessel was made by expert artisans in Chan Chan, the capital of the kingdom of Chimú on the northern coast of Peru. One of two Andean objects on display in the exhibition, it is an expression of uniquely American traditions. Still, as witness to multifaceted drinking rituals, this wide-eyed monkey is not so different from the lions, eagles, and centaurs from other far-flung places and times. If you have visited the Animal-Shaped Vessels exhibition, feel free to tell us what your favorite object was (and what you thought of the exhibition) in our online survey. 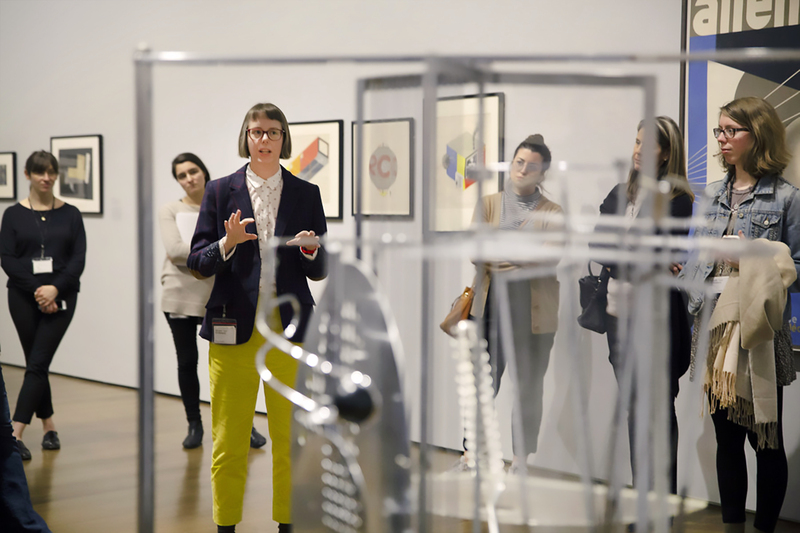 The Harvard Art Museums aren’t the only ones on campus marking the 100 years since the founding of the Bauhaus—find out how the museums and the rest of Harvard are honoring this milestone. 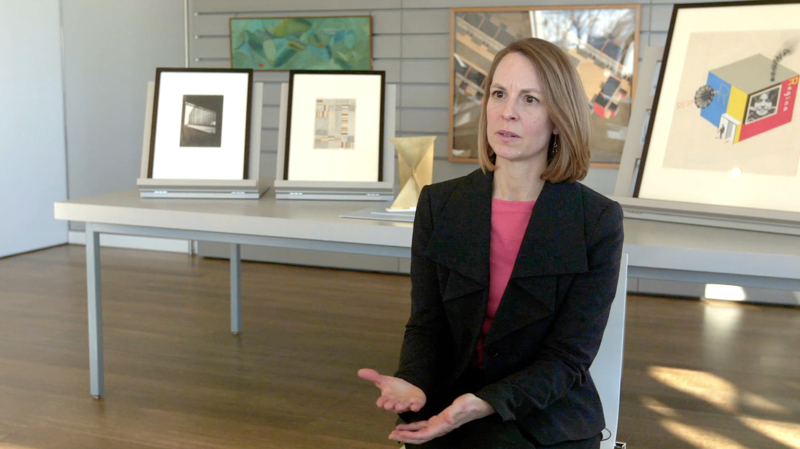 In this video, curator Laura Muir introduces our new special exhibition. 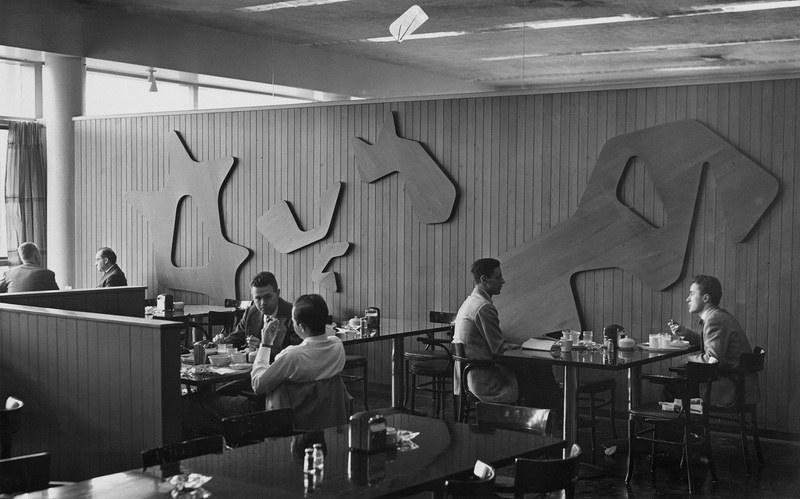 The site-specific work, once installed in Harvard’s Graduate Center, has been the focus of a yearlong research initiative to uncover its past. Fellows Melissa Venator and Madeline Corona tell the story of this complex object—revealing its history and its future.